Down syndrome is the most common cause of mental retardation and malformation in a newborn. A genetic disorder, it occurs because of the presence of an extra chromosome. Chromosomes are units of genetic information that exist within every cell of the body. Twenty-three distinctive pairs, or 46 total chromosomes, are located within the nucleus (central structure) of each cell. When a baby is conceived by combining one sperm cell with one egg cell, the baby receives 23 chromosomes from each parent, for a total of 46 chromosomes. Sometimes, an accident in the production of a sperm or egg cell causes that cell to contain 24 chromosomes. This event is referred to as nondisjunction. When this defective cell is involved in the conception of a baby, that baby will have a total of 47 chromosomes. The extra chromosome in Down syndrome is labeled number 21. For this reason, the existence of three such chromosomes is sometimes referred to as trisomy 21. In a very rare number of Down syndrome cases (about 1–2%), the original egg and sperm cells are completely normal. The problem occurs sometime shortly after fertilization; during the phase when cells are dividing rapidly. One cell divides abnormally, creating a line of cells with an extra chromosome 21. This form of genetic disorder is called a mosaic. The individual with this type of Down syndrome has two types of cells: those with 46 chromosomes (the normal number) and those with 47 chromosomes (as occurs in Down syndrome). Some researchers have suggested that individuals with this type of mosaic form of Down syndrome have less severe signs and symptoms of the disorder. Another relatively rare genetic accident which can cause Down syndrome is called translocation. During cell division, the number 21 chromosome somehow breaks. A piece of the number 21 chromosome then becomes attached to another chromosome. Each cell still has 46 chromosomes, but the extra piece of chromosome 21 results in the signs and symptoms of Down syndrome. Translocations occur in about 3–4 percent of cases of Down syndrome. Down syndrome occurs in about one in every 800 to 1,000 births. It affects an equal number of boys and girls. Less than 25 percent of Down syndrome cases occur due to an extra chromosome in the sperm cell. The majority of cases of Down syndrome occur due to an extra chromosome 21 within the egg cell supplied by the mother (nondisjunction). As a woman's age (maternal age) increases, the risk of having a Down syndrome baby increases significantly. For example, at younger ages, the risk is about one in 4,000. By the time the woman is age 35, the risk increases to one in 400; by age 40 the risk increases to one in 110; and by age 45 the risk becomes one in 35. There is no increased risk of either mosaicism or translocation with increased maternal age. Other types of defects often accompany Down syndrome. About 30 to 50 percent of all children with Down syndrome are found to have heart defects. A number of different heart defects are common in Down syndrome, including abnormal openings (holes) in the walls that separate the heart's chambers ( atrial septal defect , ventricular septal defect). These result in abnormal patterns of blood flow within the heart. The abnormal blood flow often means that less oxygen is sent into circulation throughout the body. Another heart defect that occurs in Down syndrome is called tetralogy of Fallot . Tetralogy of Fallot consists of a hole in the heart, along with three other major heart defects. Malformations of the gastrointestinal tract are present in about 5–7 percent of children with Down syndrome. The most common malformation is a narrowed, obstructed duodenum (the part of the intestine into which the stomach empties). This disorder, called duodenal atresia, interferes with the baby's milk or formula leaving the stomach and entering the intestine for digestion. The baby often vomits forcibly after feeding and cannot gain weight appropriately until the defect is repaired. Other medical conditions that occur in patients with Down syndrome include an increased chance of developing infections, especially ear infections and pneumonia ; certain kidney disorders; thyroid disease (especially low or hypothyroid); hearing loss; vision impairment that requires corrective lenses; and a 20-times greater chance of developing leukemia (a blood disorder). Development in a baby and child with Down syndrome occurs at a much slower than normal rate. Because of weak, floppy muscles ( hypotonia ), babies learn to sit up, crawl, and walk much later than their normal peers. Talking is also quite delayed. The level of mental retardation is considered to be mild-to-moderate in Down syndrome. The actual IQ range of Down syndrome children is quite varied, but the majority of such children are in what is sometimes known as the trainable range. This means that most people with Down syndrome can be trained to do regular self-care tasks, function in a socially appropriate manner in a normal home environment, and even hold simple jobs. As people with Down syndrome age, they face an increased chance of developing the brain disease called Alzheimer's (sometimes referred to dementia or senility). Most people have a six in 100 risk of developing Alzheimer's, but people with Down syndrome have a one-in-four chance of the disease. Alzheimer's disease causes the brain to shrink and to break down. The number of brain cells decreases, and abnormal deposits and structural arrangements occur. This process results in loss of brain function. People with Alzheimer's have strikingly faulty memories. Over time, people with Alzheimer's disease lapse into an increasingly unresponsive state. Some researchers have shown that even Down syndrome patients who do not appear to have Alzheimer's disease have the same changes occurring to the structures and cells of their brains. As people with Down syndrome age, they also have an increased chance of developing a number of other medical difficulties, including cataracts, thyroid problems, diabetes, and seizure disorders. Children with Down syndrome. The disease is caused by trisomy 21, meaning their bodies' cells have an extra chromosome 21. As of 2004 no treatment is available to cure Down syndrome. Treatment is directed at addressing the individual concerns of a particular patient. For example, heart defects often times require surgical repair, as will duodenal atresia. Many Down syndrome patients need to wear glasses to correct vision. Patients with hearing impairment benefit from hearing aids. In the mid 1900s, all Down syndrome children were quickly placed into institutions for lifelong care. Research shows, however, that the best outlook for children with Down syndrome is family life in their own home. This arrangement requires careful support and education of the parents and the siblings. Parents and other siblings face a life-changing event in receiving a new baby who has a permanent condition that will affect essentially all aspects of his or her development. Some community groups are committed to helping families deal with the emotional effects of this new situation. Schools are required to provide services for children with Down syndrome, sometimes in separate special education classrooms and sometimes in regular classrooms, a practiced called mainstreaming or inclusion. The prognosis in Down syndrome is quite variable, depending on the types of complications (heart defects, susceptibility to infections, development of leukemia) of each individual baby. The severity of the retardation can also vary significantly. Without the presence of heart defects, about 90 percent of children with Down syndrome live into their teens. People with Down syndrome appear to go through the normal physical changes of aging more rapidly, however. The average age at death for an individual with Down syndrome is about 50 to 55 years. Still, in the early 2000s, the prognosis for a baby born with Down syndrome is better than ever before. Because of modern medical treatments, including antibiotics to treat infections and surgery to treat heart defects and duodenal atresia, life expectancy has greatly increased. Community and family support allows people with Down syndrome to have rich, meaningful relationships and in some cases to hold jobs. 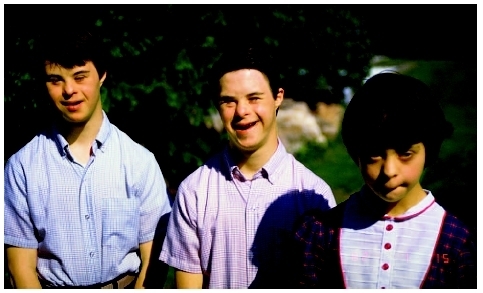 Men with Down syndrome appear to be uniformly sterile (meaning that they are unable to have offspring). Women with Down syndrome, however, are fully capable of having babies. About 50 percent of these babies, however, will also be born with Down syndrome. Screening tests are used to estimate the chance that an individual woman will have a baby with Down syndrome. At 14–17 weeks of pregnancy, measurements of a substance called AFP (alpha-fetoprotein) can be performed. AFP is normally found circulating in the blood of a pregnant woman but may be unusually high or low with certain disorders. Carrying a baby with Down syndrome often causes AFP to be lower than normal. This information alone, or along with measurements of two other hormones, is considered along with the mother's age to calculate the risk of the baby being born with Down syndrome. These results are only predictions and are only correct about 60 percent of the time. Other screening tests measure and compare the levels of other markers present in the mother's blood. A specialized ultrasound exam measures the thickness of the back of the fetus's neck (called nuchal lucency). Thicker measurements correlate with the possibility of Down syndrome or other chromosomal abnormalities. Karyotype —A standard arrangement of photographic or computer-generated images of chromosome pairs from a cell in ascending numerical order, from largest to smallest. Mental retardation —A condition where an individual has a lower-than-normal IQ, and thus is developmentally delayed. Mosaic —A term referring to a genetic situation in which an individual's cells do not have the exact same composition of chromosomes. In Down syndrome, this may mean that some of the individual's cells have a normal 46 chromosomes, while other cells have an abnormal 47 chromosomes. Nondisjunction —An event that takes place during cell division in which a chromosome pair does not separate as it should. The result is an abnormal number of chromosmes in the daughter cells produced by that cell division. Translocation —The transfer of one part of a chromosome to another chromosome during cell division. A balanced translocation occurs when pieces from two different chromosomes exchange places without loss or gain of any chromosome material. An unbalanced translocation involves the unequal loss or gain of genetic information between two chromosomes. All of these screening tests are used to decide which mothers will be offered other, more definitive testing to ascertain whether the baby has Down syndrome. These more definitive tests each carry a risk of miscarriage, which is why screening tests are an important first step. The only way to definitively establish (with about 98–99% accuracy) the presence or absence of Down syndrome in a developing baby is to test tissue from the pregnancy itself. This is usually done either by amniocentesis or chorionic villus sampling (CVS). In amniocentesis, a small amount of the fluid in which the baby is floating is withdrawn with a long, thin needle. In chorionic villus sampling, a tiny tube is inserted into the opening of the uterus to retrieve a small sample of the placenta (the organ that attaches the growing baby to the mother via the umbilical cord, and provides oxygen and nutrition ). Both amniocentesis and CVS allow the baby's own karyotype to be determined. A couple must then decide whether to use this information in order to begin to prepare for the arrival of a baby with Down syndrome or to terminate the pregnancy. Once a couple has had one baby with Down syndrome, they are often concerned about the likelihood of future offspring also being born with the disorder. Most research indicates that this chance remains the same as for any other woman at a similar age. However, when the baby with Down syndrome has the type that results from a translocation, it is possible that one of the two parents is a carrier of that defect. (A carrier carries the genetic defect but does not actually have the disorder.) When one parent is a carrier of a translocation, the chance of future offspring having Down syndrome is greatly increased. The specific risk will have to be calculated by a genetic counselor. Parenting a child with Down syndrome can be both challenging and rewarding. Children with Down syndrome have a wide range of potential outcomes. Early intervention programs have been proven to be of great help in assisting these children in achieving the highest level of functioning possible. There are many support groups available for parents and siblings of Down syndrome children. Hall, Judith G. "Chromosomal Clinical Abnormalities." In Nelson Textbook of Pediatrics. Edited by Richard E. Behrman et al. Philadelphia: Saunders, 2004. Simpson, Joe Leigh. "Genetic Counseling and Prenatal Diagnosis." In Obstetrics: Normal and Problem Pregnancies. Edited by Steven G. Gabbe. London: Churchill Livingstone, 2002. Canick, J. A. "Prenatal screening for Down syndrome: current and future methods." Clinical Laboratory Medicine 86 (June 2003): 395–411. Roizen, N. J. "Medical care and monitoring for the adolescent with Down syndrome." Adolescent Medicine 13 (June 2002): 345–58. Tyler, C. "Down syndrome, Turner syndrome, and Klinefelter syndrome: primary care throughout the life span." Primary Care 31 (September 2004): 627. National Down Syndrome Society. 666 Broadway, 8th Floor, New York, NY 10012-2317. Web site: http://www.ndss.org. i think that these children are a gift from god. They are here because nothing is dangerous or scary in their world, they are sweet wonderful people. I Think that this is a great article. It gives many information about what I need to know about people who have down syndrome. I have a little cousin who has it and i didnt see all the things that its about and now with this i can i dont see how more special she can be to me. This article also helps a lot when your doing projects,researches and more about down syndrome. Also i love the last sentence on this article the kids are not scary or dangerous to this world they are just like us they are lovable good smart kids!!! Keep up the good work i am looking forward to reading another of your great articles.